our house and sounded the alarm. Before children, my mother had taught Home Ec and had an idea about what houses should look like when company came. I participated in the last minute frenzy to stuff newspapers under the couch, put piles of things down on the basement steps, and gather up random things that didn’t belong where they were and hide them in drawers. preferred playing the piano, embroidering towels, crocheting edges for delicate linen handkerchiefs, trying out yet one more new souffle recipe, making candles, quilting a gift for a new baby and even mending socks and worn-out clothes. It wouldn’t have been Christmas Eve at our house if Mother hadn’t been up until almost morning with the sewing machine humming. Occasionally the doll clothes or special gifts didn’t get finished, and we unwrapped packages from “Mrs. Santa Claus” that contained partially completed projects and a note asking that we give the whole box back to our mother so that she could get it back to Mrs. Santa Claus. She’d usually had some problem between Thanksgiving and Christmas that set her back a bit. We were conditioned to receiving these sorts of messages and grew up understanding about how difficult it was for Mrs. Santa Claus to do everything. After all, wasn’t she a woman, and isn’t a woman’s work never done? I bet you think I’m going to seque into telling you about how I was, therefore, so conditioned from an early age to this sort of thing that not getting all the gifts made before the holidays is not really a character defect…..It was, rather, learned behavior. Well, surprise, surprise. I loved my parents but did not love being late, although for years I followed their same script. Then somewhere between late childhood and now I realized that I could start making (that is, knitting) my gifts way ahead of time, like even in January. And I learned that there was no law forbidding the gradual making of holiday gifts, spreading them out through the entire year, up to the holiday itself. The last minute rush was not mandatory or necessarily desirable. And so I had tried to live my life this way—especially when I got it back after leaving healthcare to knit seriously full time. This isn’t to suggest that neither of my children ever opened a wrapped gift box to find either needles, yarn and a pattern or a partially completed item. It did happen several times, but it wasn’t my regular practice and plan. So, it is with some chagrin that I am now working to finish my son’s holiday stockings. They were in the queue and cast on so that they could have been completed in time. However, the whole plan went awry on Thanksgiving Day. We had just enjoyed a wonderful turkey dinner and were all sitting around on comfortable living room furniture in an L-tryptophan-induced blissful state (or whatever comes from enjoying lots of turkey). Imagine my horror to see, when my son put his feet up on an ottoman, gaping holes in the bottoms of both his socks—-and yes, they were (like most of his others) ones that had been made for him by his mother! He looked very chagrinned when I said something subtle like, “OMIGOD, the bottoms of your socks are gone!” After all, he’d only worn them about 7 years. Smart son that he is, he quickly said, “these are my favorite socks, I’ve worn them every week since you made them for me and I didn’t want to part with them,” which is what I think he thought would have happened had he told me about this obvious problem sooner. 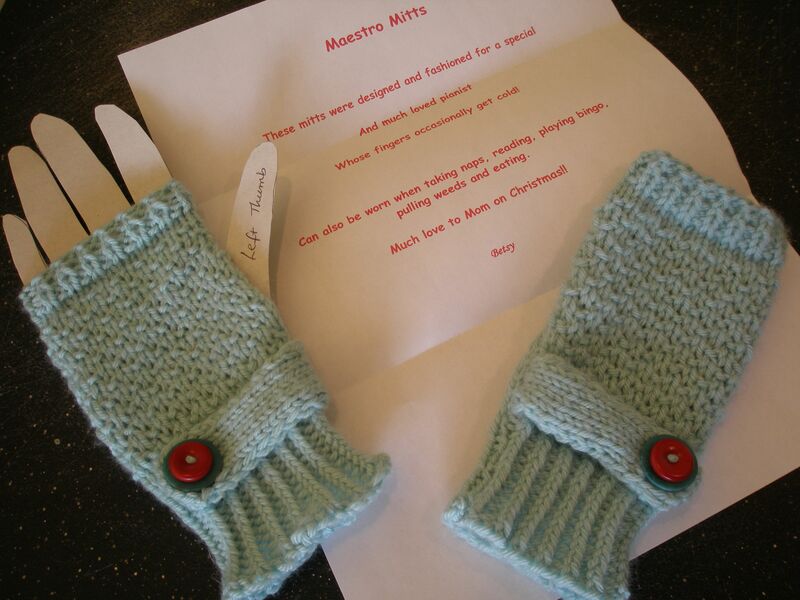 Well, was my heart warmed by his love of these socks that I had made with mee own lyttle hands? It told him that I’d fix them and have them back to him before Christmas. He was so moved at my offer that he went into his bedroom and presented me with another “favorite” pair that looked like they had been worn in the Chicago Marathon in lieu of running shoes. I felt even more choked up about his also having so lovingly saved these socks and said that I’d fix them right up, too, before the holidays. What was I thinking of??? He is over 6 feet and his feet are not small—plus he has a small mountain of socks that I’ve knit over the years which I’ve occasionally seen when visiting after a BIG LAUNDRY–the reason for which I’ve never inquired. I dug through my leftover yarn and stash and found some matching yarn to make two new feet for one pair—-it took a while, but they looked fine. An untrained eye (not any of yours, however) would not have been able to distinguish the new feet from the old heels and legs. Whew. On to pair #2 which was unfortunately made from discontinued yarn, and I had none leftover in the large sock leftovers basket that I stuff under a settee in my living room. Ravelry to the rescue!! I actually found two skeins of the yarn in the stash of a very wonderful Canadian woman who agreed to sell them to me and even to mail them right away to my brother’s house in Illinois where I headed for my mother’s memorial service. I don’t mean this to be disrespectful and actually believe my mother would have been strongly approving of my doing this while visiting with the relatives, while pausing a few minutes from helping my brothers with various details afterwards and on the return trip home. 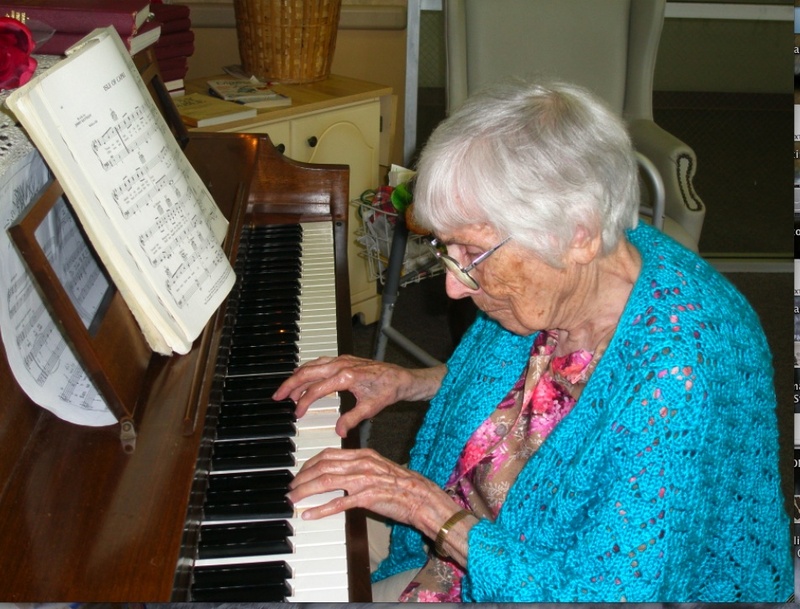 She was the embodiment of practicality and also so loved things handmade. what they looked like. 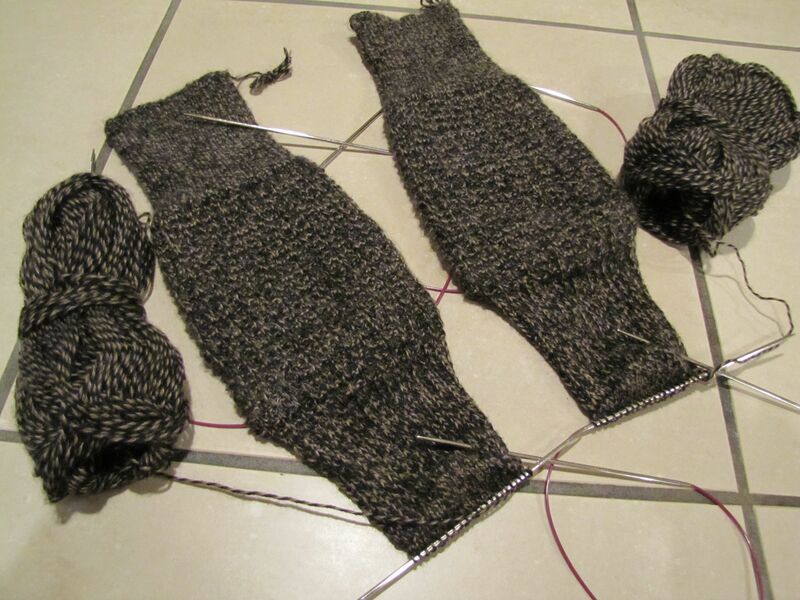 I worked each one on two circular needles, sequentially, the ribbing on one, the ribbing on the other, the leg on one, the leg on the other….They are bigger than they look: 10″ from cast on to beginning of heel flap. Right now I’m working on the gusset decreases on the second sock and estimate that by tomorrow night, if I keep pushing, I’ll have the pair finished….and, therefore, be able to close the Holiday 2009 chapter. Who says knitters aren’t a wee bit compulsive??? I could have just waited to give these to him for some other special event, but they are his holiday 2009 socks and he will have them before this weekend! Since the last blog, I taught a 6-hour beginning sock workshop and completed the final review of the manuscript for the revised “Knit Socks!” I’m glad the book is finished and very pleased with it. Before it’s published in September 2010, I’ll preview a pattern or two. 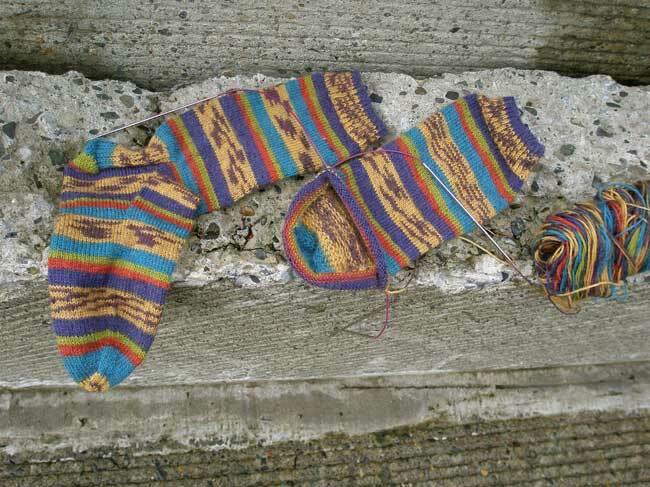 The brightly striped socks I’ve been knitting on and off (mainly off) for a few weeks somehow got finished. My husband Terry is smiling in anticipation of their being added to his handknit sock collection. He was very supportive of all the comings and goings of the tv crew and took the disruptions in stride. He was called upon to do a number of above and beyond things, such as walking our dogs in their sweaters (with him in his winter coat) on a warm day. He’s more than earned the socks, but I’m not sure how I will repay the dogs as they don’t seem to be angling for another set of matching sweaters. Here are the socks on the owner’s feet, and as you can see, they fit. I’ve had lots of practice making socks for Terry, so it would have been a bad surprise if they hadn’t. I cast 72 stitches onto size US 1 needles, made a plain stockinette stitch leg with the distance from the cast on to the beginning of the heel flap being 8 inches. The heel flap is 2-3/4″ long, and the length of the finished foot is 11 inches. This Kristin Nicholas’ designed sock yarn has great yardage; the label states 459 yards (420 meters) in a 100 gram ball. 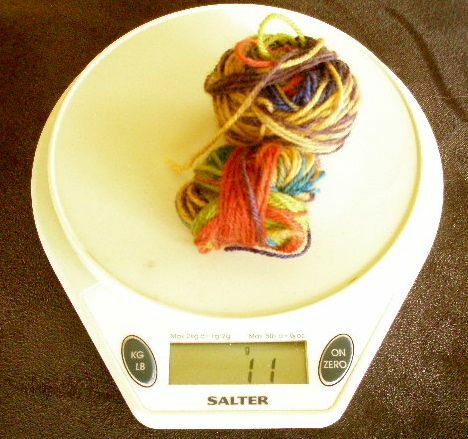 I try to remember to weigh and record the weight of the ball before beginning any sock, as well as weighing the finished socks and any leftovers afterwards. I then record (in my little black book) how many yards I used to make the socks. As you can see, the 100 gram Nashua sock yarn skein that I had was very generous, weighing 105 grams (which means that there were 23 extra yards of yarn), for a total of 482 yards. For most women’s socks this wouldn’t matter, because a pair is easily knit from a 100 gram ball with some left over. However, if I weigh what should be a 100 gram skein only to find out it’s 96 grams, I’m very careful about how large the socks are going to be. Or I may tentatively plan to make the toes and/or heels a different color if I’m making socks for a man or woman with larger feet. While Nashua’s yardage was overly generous this time, this isn’t the case with all yarns and probably isn’t with all balls of that yarn either. 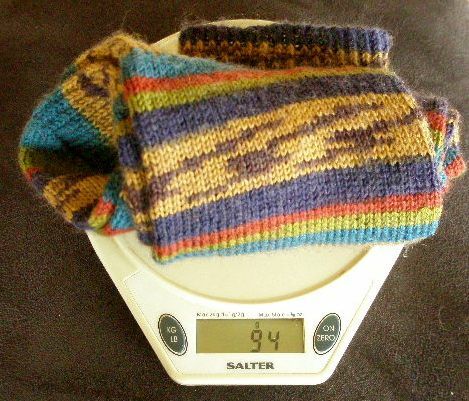 So, I will continue weighing rather than assuming because what you see isn’t always what you get with yarn. I’ve returned to real life and knitting today following the tv spot adventure. It felt good to pick up the sock-in-progress and knit a few rounds as I enjoyed my first cup of coffee in the quiet, early morning light. The socks have been waiting patiently, as knitting projects do, maybe even appreciating being left alone for a while after all the excitement. The first sock is done, and I’m working the gusset decreases on the second, using two circular needles. I walked the socks to a small urban park created from materials salvaged when a bus transit mall was relocated. They were a bright spot on an otherwise grey, wet day in the Northwest. Click on the image below to see them in more detail. The yarn was a new one to me: Nashua Handknits “Best Foot Forward” sock yarn, designed by Kristin Nicholas. And it was love at first sight, even before I knew who designed it. I’ve always loved her choice and use of colors , from her early ethnic-patterned Classic Elite socks to the darling lamb sweaters she recently displayed on her blog,” Getting Stitched on the Farm.” My socks are made in the color #7333 Plum Harvest. Next, I’m going hunting for some #7336, Kilim, or maybe #7331 Blueberry Field, but then what about #7329 Autumn? What a wonderful problem for a sock knitter—all the colors are absolutely beautiful! This yarn makes for very satisfying social sock knitting! And, yes, Jane was impressed, as is everyone on first seeing what can be done with self-striping yarns! They’re so much fun for sock knitters, from beginners to the most experienced. What a day and so little sock knitting to show for it…. This post is by necessity short–I’m even too tired to knit and that’s really tired! I finally got to see the Today Show segment on aarp.org and the articles posted there. I smiled as I read about teaching my daughter to knit. She loves knitting, too, and here I once thought it might skip a generation! The comments, e-mails and feedback from the AARP segment and blog strongly reinforced what I already believed. We are not alone, and we are more alike than we are different. And those of us who are knitters really love knitting!! It keeps us sane. It floats our boat. It is our yoga. Before going to bed, I picked up the sock, still unfinished, that I’d been knitting during the interview with Jane. Someone asked if I’d made any mistakes knitting while being filmed. The answer is a murky yes; however, I didn’t make any of the usual knitting mistakes. I knew better than to knit something requiring thought or close attention and chose to work on a plain, stockinette sock foot. Not surprisingly, because I am a pretty fast knitter, I knit way beyond where the toe shaping should have started as the interview stretched out into 90 minutes. I realized this was happening but continued on anyway. Does that count as a mistake or not? It doesn’t really matter because whatever it was, it required the same unknitting afterwards to get back on track. More about the sock soon, including a picture and information about the wonderful new yarn I used to make it . after age 50. And yes, it was true; I had done this 10 years before when I left the 9-to-5 world of healthcare administration and took up my knitting needles full time. 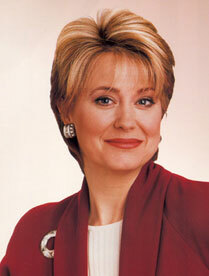 You could have knocked me over with a pin, however, when the caller said that the TV project was going to be a Today Show segment hosted by Jane Pauley and sponsored by AARP. I am not one to search out cameras and lights. The thought of it was, to put it mildly, a bit terrifying. Now, however, I’m glad I decided to give it a go because this unexpected life chapter turned out to be a fascinating adventure. The week began at Java House where the producer and camera crew joined me and my Tuesday knitting community in our favorite sunlit atrium spot. Footage of my husband Terry, our dogs and me in our condo followed in the afternoon, as well as a dog walk in Esther Short Park. The dogs, of course, looked great in their matching pumpkin-colored “Dandy Dog” sweaters. The condo footage included the inside of our closet! It houses lots of handknit socks stacked in rows (albeit neater and more color-coordinated rows now than before the film crew was scheduled to arrive.) And no, the whole stash didn’t line up for a big group shot (after all, this was all being done for a relatively short video segment), but yarn was played with and more photos taken. Wednesday held more filming and finally the trip to Tacoma, WA, where the annual Madrona FiberArts Festival was about to begin. Friday morning I finally met Jane, was interviewed by her at Yorkshire Yarns in Lakewood, WA, and then walked her through the yarn market at Madrona where she was excited and surprised by the beauty and varied fibers available to knitters today. Signing copies of "Knit Socks!" Jane absolutely flew by. It was like two girls from Indiana talking (I was born there, but grew up in Illinois) about something they felt passionate about. She was down-to-earth, very approachable, warm, and when I put knitting needles in her hands later in the marketplace, they remembered what to do with them! She hadn’t knit since she’d been pregnant with her twins who are something like 27 now! And she left Madrona inspired by all the wonderful yarns and carrying (like the rest of us) a skein of yarn that spoke to her and a new circular needle to use on the plane ride back to NYC. The experience was a wonderful gift of the sort that comes to us unexpectedly–out of the blue, to use part of the subtitle of Jane’s autobiographical book, “Skywriting: A Life Out of the Blue.” It caused me to reflect upon the experiences I’ve had because of knitting, the wonderful friends I’ve made, what I’d given to others, how I’d spent my last 10 years and what I’ll do during the next. 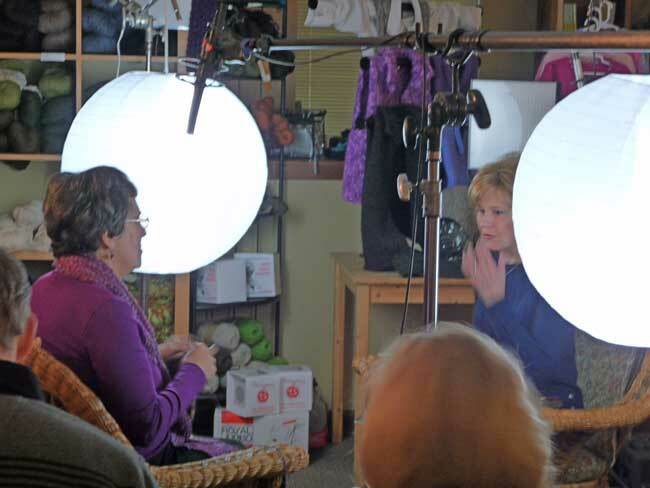 It occurred to me that any number of other knitters could have been the subject of this film segment, too. 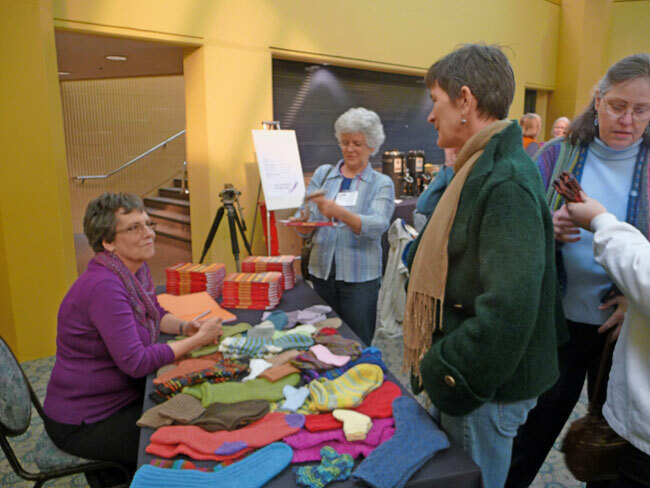 That’s one of the things I love about hanging out with knitters and spinners—they’re good people with great stories. 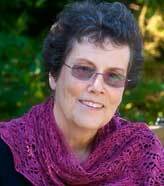 Ten years ago life became more fun when I left a 9-to-5 career to reinvent myself as a serious knitter. When I’m not teaching, writing or designing, I am usually knitting–often socks in coffee shops, theaters, dentist offices and on the sidewalks of my neighborhood. At home in quieter moments I enjoy lace knitting that is meditative and centering….yoga with yarn. 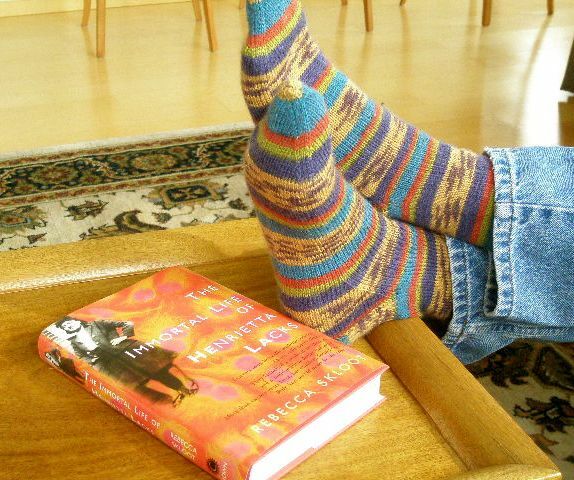 My book Knit Socks!, first published by Storey Publishing in 2004, is being re-issued in an expanded version in September 2010. 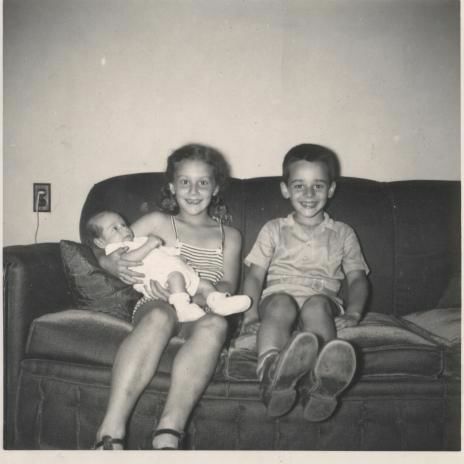 I hope you will visit my blog often and look forward to hearing your comments.